Wisconsin Lutheran High School values your privacy. This policy governs its data collection via wlhs.org. By using the Wisconsin Lutheran High School website and E-mail system, you are deemed to have consented to the practices described in this policy. Wisconsin Lutheran High School shall keep confidential personal information that it collects such as first and last name, E-mail address, home or other physical address, telephone number, and facsimile number. Wisconsin Lutheran HIgh School will inform you of the purpose for its collection of information. It does not intend to transfer your personal information to third parties without your consent, except under the limited conditions described below. If you choose to provide us with your personal information, we will use that information at Wisconsin Lutheran High School or we may transfer it third party service provider as necessary. Wisconsin Lutheran High School may also collect electronic information during your use of its website. Wisconsin Lutheran High School may collect domain information to enable it to analyze how visitors use this site. This data enables Wisconsin Lutheran High School to become more familiar with people who visit its site including how often they visit, their access times, and browser type. Wisconsin Lutheran High School will use this information to improve its services and obtain statistics regarding the use of its site. Wisconsin Lutheran High School may also use the information to which it has access to provide you with or solicit other information and to let you know of additional services that may be of interest to you. Wisconsin Lutheran High School will provide you with the opportunity to opt out of these communications. Wisconsin Lutheran High School does not share your information without your permission, except if you consent to share your information to a third party service provider working on behalf of Wisconsin Lutheran High School. Wisconsin Lutheran High School will also disclose your personal information, if required to do so by law, or in urgent circumstances, such as, but not limited to, those that involve the need to protect an individual’s personal safety, the protection of the public or the protection of Wisconsin Lutheran High School’s rights or property. Wisconsin Lutheran High School will not sell, rent or lease your information to anyone, or let anyone use it except if you have authorized its use. Children under 13 years old are not the target audience for our website. To protect their privacy, Wisconsin Lutheran High School prohibits the solicitation of personal information from these children. Wisconisn Lutheran High School strives to protect your personal information; however, we urge you to take every precaution to protect your personal data when you are on the Internet. Please take proactive steps to secure your personal data, such as frequently changing your passwords. Wisconsin Lutheran High School’s website may contain links to other sites. Please be aware that we are not responsible for the content or privacy practices of such other sites. Wisconsin Lutheran High School encourages you to learn about the privacy practices and policies of those companies. Wisconsin Lutheran High School reserves the right to change, modify or update this policy at any time without notice. Any substantial changes in the way Wisconisn Lutheran High School uses your personal information will be posted on this site. You may opt out of any future contacts from us at any time. You can do the following, at any time, by contacting us via E-mail at info@wlhs.org or via phone at 414-453-4567. The information contained herein is the exclusive property of Wisconsin Lutheran High School and is intended for the sole, non-commercial use of WLHS families. This privacy notice discloses the privacy practices for wlhs.org. Information submitted to Wisconsin Lutheran High School, electronically, is kept confidential and is not made available to other individuals, organizations, or institutions. We are the sole owners of the information collected on this site. We only have access to collect information that you voluntarily give us via email or other direct contact from you. We will not sell or rent this information to anyone. Question - What is one of your favorite spring flowers? Result - What is one of your favorite spring flowers? Question - It's a great time for Wisconsin sports. Which Milwaukee sports do you enjoy watching? Result - It's a great time for Wisconsin sports. Which Milwaukee sports do you enjoy watching? On Friday, April 19, nine students, accompanied by Mr. Andre Gosch, headed to the Caribbean island of Grenada on the first international WWW mission trip of the year to help Grace Lutheran Church run their annual Easter Camp. They also helped local children learn and practice swimming, played games, studied music and taught the Word of God. 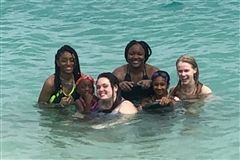 In their free time students had the opportunity to explore Grenada, sightsee and enjoy the beach.